These new pictures were observed by the HiRISE instrument onboard the MRO currently orbiting the Red Planet. Since its orbital insertion in 2006, the orbiter, a multi-purpose satellite, has returned some of the highest resolution images ever seen of the surface of Mars. Back in March, the HiRISE instrument took pictures of an escarpment in the north polar region of the planet. Along this scarp, HiRISE captured four separate avalanches occurring hundreds of kilometres apart. Never before had such a geologically dynamic event been captured by a Mars orbiter. And now for the lowly rock. Looking at these new HiRISE images (taken on March 6th), it appears that rocks roll on Mars too. It’s not that we didn’t already know this, but this is the first time we’ve been able to resolve recently disturbed surface debris after it has rolled some distance down a slope on Mars (objects measuring ~167 cm across are resolved). What is really special are the very clear tracks from the rolling rocks imprinted in the regolith. 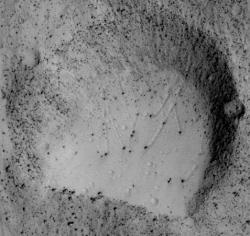 In one example (pictured top) a large boulder (about 4 meters in diameter) had rolled down the crater side, picked up speed, hit a mini crater, skipped and bounced down the slope until coming to a stop. Taking a rough estimate, the rock in the image possibly rolled for a few hundred meters. These images were taken around the southern branch of Shalbatana Vallis, where it links with Chryse Planitia. It is thought that the boulders were disturbed in some way, breaking them loose from the crater edge (possibly a meteorite impact or other tremor) as there are several tracks in the regolith pointing in two directions. It also seems possible that they might be the ejecta from another meteorite impact in the area. ITS GOOD TO SEE THAT MARTIANS LIKE ROCK AND ROLL TOO……..
Why don’t you link to the original high resolution images?! Grrr. There is always something interesting on this website – keep up the good work! i like that you can actually see the difference in the behavior of things we take for granted here on earth. And i agree with andrea, great site, keep it up! Any guesses as to the size of this rolling stone? I just spotted the 4 meter size in the article. That’s about 12 feet in height. Ouch “look out”! I know what you mean, it does seem a little unremarkable. After all, a rolling rock has little or no relevence on the grand scheme of things. This is more of a curiosity on a cosmic scale. But the two things that did grab my attention was a) how amazing it is that we have such hi-res images taken by a satellite orbiting 150-200 miles above a planet tens of millions of miles away, and b) that we are actually witnessing geological activity we are more used to on Earth. Seeing all the static, but excellent images coming from Mars, we rarely get any impression of movement on the surface. It’s just nice to see things like avalanches and rolling boulders. And that boulder must have been rollin’ pretty fast, looks like it got launched 40 meters after hitting the ramp ofthe small crater! Imagine that thing flying through the air! I suppose some science could be done by looking at the size of the bounce marks, might reveal the integrity of the regolith…? that enough data to prove a rock can obey the laws of physics? Rocks tend to roll down hills if something puts them in the right starting position. But what is putting a boulder onto such a starting position on Mars? It is amazing to see that a boulder bounces down the slope of a martian meteor crater that is many hundreds of million years old – NOW. What has been keeping that boulder from bouncing down the crater slope during these hundreds of millions years? There is very little erosion on the martian landscape. There hasnÂ´t been any rainfall for billions of years. The martian air is so thin that even its tornados are just able ro move a little bit of fine dust. If something manages to break a boulder from a slope and makes it bounce down, this is worth while to investigate.